Sky has signed up the doyenne of nature documentaries Sir David Attenborough to write and present one of the broadcasters high profile forays into 3D – Flying Monsters 3D. Attenborough's instantly familiar voice has become associated with the highest quality shows from the BBC, and his presence will add huge gravitas to the Sky show. The film will be released theatrically in both large format and IMAX cinemas globally before making its television debut on Sky 3D – the UK's first dedicated 3D channel. "The film focuses on pterosaurs - flying vertebrates with a wingspan of up to 45 feet who lived 200 million years ago," explains Sky. "It will use cutting-edge 3D TV technology to bring the prehistoric world alive. Viewers will be immersed in the environment that these creatures - the size of small jet aeroplanes - inhabited." Sky has already invested heavily in 3D – with its strength in producing sport and buying up top quality movie rights for television putting the company in a fine position for the arrival of mainstream 3D. 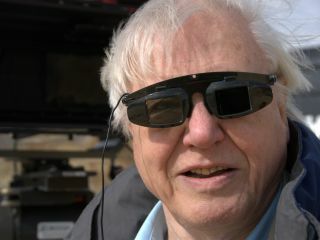 Sir David Attenborough said: "Having learnt my television skills in the days of black and white, and been involved with the introduction of colour, I'm thrilled to be part of one of the first 3D television projects. "3D is a wonderful way of seeing the world as the pterosaurs did, and it's to Sky's credit that they've taken on the challenge to be the first to broadcast in 3D. "Pterosaurs are the most unlikely of creatures, but they dominated the skies for millions of years and now this film will enable us to fly in 3D with the largest flying creatures the world has ever seen." The prospect of 3D, Sir David Attenborough AND flying dinosaurs might even be enough to convince us to go out and spend the premium for a 3D television.